RMEB Inc. is a full service Auction company that conducts successful Auctions, estate sales & liquidations in Denver, Boulder, Fort Collins, Greeley and the entire states of Colorado, Wyoming and Nebraska onsite or at our Auction house located in Eaton Colorado using award winning Auctioneers. We auction and sell real estate and personal property including industrial equipment, vehicles, trucks, tools, antiques, coins, fine art, firearms, cars and complete esates. Well last weekend we had eight inches of snow for our Absolute Auction preview of 80 acres of Larimer County Colorado Land and we still had numerous people brave the weather to come see this great property. The weather forecast for this Sunday says it is going to be a wonderful Colorado fall day with a high of 74. We will be conducting an Auction preview at the property located at the Northeast corner of Owl Canyon and Terry Lake roads from 1:00 – 3:00 PM. 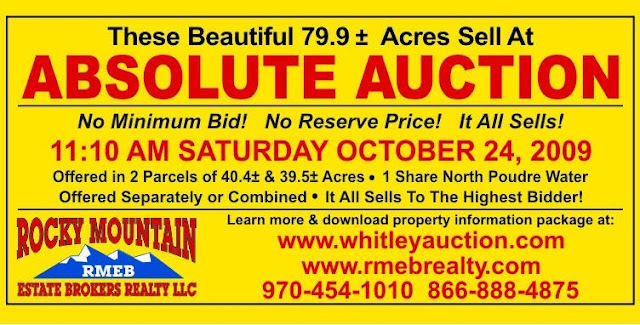 Come and check out this great Larimer County Colorado Property we will sell at Absolute Auction on Saturday October 24, 3009. It has great access and is close to Fort Collins and Wellington. Check it all out here. This property and one share of North Poudre water sell at Auction to the highest bidder. Do not miss this opportunity to purchase Colorado land and auction. Let us all be thankful the little boy was not really in the balloon! Have a great weekend! Visit our web sites at http://www.whitleyauction.com/ and http://www.rmebrealty.com/. We have another great Colorado Absolute Real Estate Auction coming up soon. It is 11.33 acres of prime development ground in Boulder County Colorado annexed to the City of Longmont. Check it out. If you have been looking for a country home site with great access we have an auction coming up soon you need to check out. On Saturday, October 24, 2009 at 11:10 AM we will sell at ABSOLUTE AUCTION with NO MINIMUM BID and NO RESERVE PRICE a wonderful 80 acre parcel of Larimer County Colorado land. The out of area owner of this wonderful Colorado Property has decided it is time to get it sold. We have been hired to sell it to the best and highest bidder at ABSOLUTE AUCTION with NO MINIMUM BID and NO RESERVE PRICE. This property will sell Auction Day. The property is located at the northeast corner of the intersection of Owl Canyon Road and County Road 15 (Terry Lake Road) which is a little over 4 miles west of I-25 on the Owl Canyon Road. This property has great access with paved county roads to I-25, Wellington and Downtown Fort Collins. Seldom does anyone get the opportunity to purchase Larimer County land at Absolute Auction. This property is in an excellent location with wonderful views and great access. Whether you are looking to expand your land holdings or purchase your dream home building site, make plans to attend the auction. This property will sell to the highest bidder or bidders on Auction Day. Somebody could get a Fantastic deal. That somebody should be you! This property is split by an irrigation ditch and will be offered in two separate parcels. The west parcel is 39.5± acres and the east parcel is 40.4 acres. One share of North Poudre Irrigation Company water will also be sold. The two parcels and the water will be offered individually and in combinations and sold in the manner that realizes the highest price. Do your homework now and be prepared to buy on Auction Day. Do not miss this Absolute Auction. The west parcel, Parcel 1 includes 39.508± acres including right of ways and is where the original farmhouse and outbuildings were. It is in the northeast corner of Owl Canyon Road and County Road 15, which are both paved and county maintained. It has level terrain with a gentle slope to a small hill in the center of the parcel. The hill would make a wonderful building site for a home with a walk out basement that would have fantastic southern exposure and great mountain views. This parcel is large enough that, in the long term, you could possibly split the four acres that border the corner off and develop it. This parcel has at least two springs on it including one that was used for water at the original dwelling. There is currently electric and telephone service on the property. Come see it for yourself. 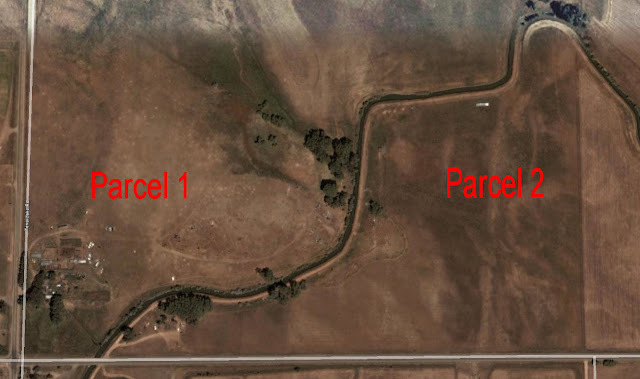 Parcel 2 is directly east across the irrigation ditch from Parcel 1 and includes 40.410± acres including right of ways. It is bordered on the south by paved and county maintained Owl Canyon Road. It appears that this parcel was never built on and that it was used as an irrigated farm field. It has level terrain that slopes gently to the south. This parcel has several wonderful locations to build your dream home with southern exposure. There is currently electric and telephone service on the property. Attend the previews and fall in love with it as we have. This property will be sold at Absolute Public Auction on Saturday, October 24, 2009 at 11:10 AM. It will be offered as a complete unit with Parcel 1, Parcel 2 and 1 share of North Poudre water. The two parcels and the water will also be offered separately and in any combination you desire. The bidding will continue until there is no increase in the total price of the two parcels and the water. It will be sold in the manner that realizes the highest return for the seller, whether that be separately or combined. Attend the Absolute Auction and make your best bid. See complete details at http://www.whitleyauction.com/Larimer-County-Colorado-Farm-Ranch-Land-Auction-Near-Fort-Collins-a119454.php. The owners of Little River Ranch have decided it is time to get some of their wonderful Colorado mountain home sites SOLD! Rather than have sales or special promotions they decided to let you place your best bids at PUBLIC AUCTION. They are committed to the Auction. Five of these home sites will sell to the highest bidder regardless of price on Auction Day. The others will be sold subject to the owner’s confirmation of the high bid. There will be many opportunities to purchase these home sites at never before seen prices. Home sites in this community have sold for up to $212,000. Little River Ranch is located South of Salida and east of Poncha Springs, Colorado. The South Fork of the Arkansas River, known to locals as “Little River”, runs through the middle of it. When you buy a home site at Little River Ranch, you get access to the close to two thirds of a mile of the river. If you ever wanted to walk out your back door and fly fish this is the place for you. This is Colorado Mountain living at its finest. With the manageable lot sizes and infrastructure, you can spend your time enjoying the Salida area and not worry about septic systems, wells and propane tanks. Little River Ranch is annexed by the Town of Poncha Springs and each home site has full city utilities. The streets and roads are paved or will be as each phase is sold. The Town of Poncha Springs even plows when it snows. Many have tried the country life before with the 5, 10 or 15 acre home site and found they spent all their time taking care of the property. The .25 to 1.5 acre home sites here are perfect. At Little River Ranch, you can spend your time exploring the surrounding San Isabel National Forest, the Arkansas River, the 14 nearby 14,000-foot mountains and historic downtown Salida. Little River Ranch invites you to become a part of its community. Whether you plan to build this fall or in five years, take the time to investigate this rare opportunity. In good times and in not so good times location is still the number one ingredient in property value. Little River Ranch is seen by many as the nicest community of its type in the area. If you have ever dreamed about owning a Colorado Mountain home site your dreams may just come true on Saturday July 11, 2009. Opportunities like this, with today’s economic conditions, may only come along once in a lifetime. If Little River Ranch sounds like it might be right for you please attend a preview and see the amenities it, and the Salida area, have to offer. You will probably have only one chance in your lifetime to buy a home site in Little River Ranch at your best bid. Only those who attend the Auction on Saturday July 11, 2009 and bid will be able to take advantage of this opportunity. Please attend a property preview and tour. Download the Property Information Package and check out the other information and photos we have posted here. If you have any questions, please contact us. If Little River Ranch is right for you, come see us at the Auction. Did you ever go to a dude ranch or summer camp as a kid and wish you could one day own it? Well now you have that opportunity. Rocky Mountain Estate Brokers Realty LLC will sell, at Public Real Estate Auction on February 28, 2009, Alpine Mountain Ranch. Alpine Mountain Ranch is a fantastic Colorado Mountain Property with numerous potential uses. It could be used as a guest ranch, fantastic mountain home, corporate retreat, family reunion center, wedding facility, church camp, conference center, health and beauty spa, hunting camp and more. The Colorado property includes 56 beautiful acres that border the Roosevelt National Forest. If you pack a lunch, you could leave this mountain property walking north and never leave National Forest land until you reached Wyoming. It has spectacular, panoramic Rocky Mountain views not to mention the secluded valley with a stream, beaver pond and many quiet spaces. The property is located about one mile east of Allenspark, Colorado, which is about 16 miles south of Estes Park, Colo. Alpine Mountain Ranch is easy to get to from Denver, Boulder, Loveland, Longmont, Fort Collins and Cheyenne, Wyoming. 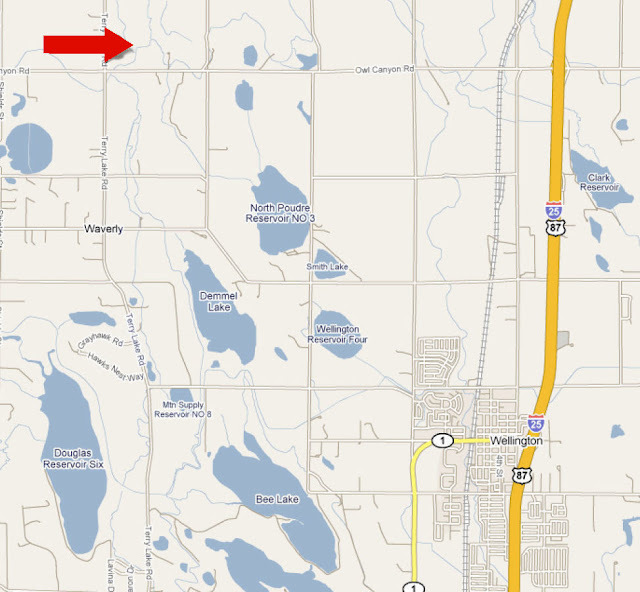 There is a paved road into the property right off state maintained Highway 7. Denver International Airport is only about an hour and a half drive. This is a once in a lifetime opportunity to purchase at Public Auction, a Colorado property like this, at a fire sale price. The property includes a three story lodge with guest rooms totaling over 12,000 square feet, a 28 stall barn with office, tack room, lofts and turn-out pens, Four cabins, a recreation building and covered picnic area and a wonderful below ground swimming pool, hot tub and sauna building. The views from the property are breathtaking. There is direct access to the National Forest as well as a stream on the property. Bring you hiking boots and come see what could be yours. This property was purchased in 1999 for over $1,300,000.00. The new owners then spent close to $1,000.000.00 building a new barn, adding fencing and corrals, drilling a new well, adding landscaping, completely remodeling and updating the large lodge and more. It was appraised in 2002 for $3,000.000.00. The real property will be sold at Public Auction subject to a minimum bid of $1,100,000.00 including the buyer's premium. The contract to buy and sell real property will contain no contingencies for financing or anything else. The property will be sold in its present as-is condition. Closing will be on or before March 13, 2009. Brokers can earn 2.8% on this transaction. The owners spared no expense in outfitting this property. The lodge is furnished with Mission and Rustic style furniture. There is a complete commercial kitchen. We will also sell all of this high-end personal property separately at the auction. You will now have the opportunity to purchase these items at your best bid. This is an extremely short notice auction. Visit our websites at www.whitleyauction.com or www.rmebrealty.com for updates, photos and much more information. Mountain property like this seldom is available to purchase at auction let alone at a minimum bid like this. Do your homework and see what this property is truly worth. Someone is going to get a super deal on this property at the auction. We hope it is you. See complete information, auction bidder's packet and updated auction terms at http://www.whitleyauction.com/ or http://www.rmebrealty.com/. Online bidding is available here. All information contained here was derived from reliable sources believed correct, but is not guaranteed. Check it out at http://www.whitleyauction.com/ or http://www.rmebrealty.com/ and then come to the auction. Rocky Mountain Estate Brokers Inc. is a full service Auction & Real Estate company that conducts successful Auctions, estate sales & liquidations in Denver, Boulder, Fort Collins, Greeley and the entire states of Colorado, Wyoming and Nebraska onsite or at our Auction house located in Eaton Colorado using award winning Auctioneers. We auction and sell real estate and personal property including industrial equipment, vehicles, trucks, tools, antiques, coins, fine art, firearms, cars and complete estates. Check out our websites at www.whitleyauction.com and www.rmebrealty.com. Call us at any time at 970-454-1010 or toll free at 866-888-4875 to learn more about our successful auctions. RMEB Realty LLC Home Page. Colorado Real Estate Auctions & Sales. RMEB Inc. is licensed, bonded and insured to conduct auctions in Denver, Fort Collins, Boulder, Greeley, Cheyenne, Loveland, Longmont, Estes Park and other cities and towns throughout Colorado, Wyoming and the Rocky Mountain Region. We can auction and sell your personal property or real estate throughout North America through our partnerships with US Auction Group. If you are interested in real estate auctions or sales please visit our sister website at www.rmebrealty.com to find out more information about upcoming real estate auctions and real estate sales. Our large Eaton Auction Center serves as a massive Auction House if an on-site auction is not right for you. Our Auctioneers will professionally conduct your auction or liquidation at your location or ours. Subscribe To Colorado Real Estate Auction News. A beautiful Colorado Auction Day! Buyer's with empty trucks ready to purchase items at an RMEB Colorado Auction.